Lean achieves lowering of costs through waste reduction and better management of manufacturing processes and procedures. Gain mastery in the application of Lean Six Sigma methodologies by participating in Lean Six Sigma Black Belt Certification Training Course delivered by pdtraining in Boston, Charlotte and other cities in the U.S. Lean integrated with Six Sigma achieves optimization of processes and lowering of costs. These two vital factors affect almost every area of manufacturing, including customer satisfaction, pricing, planning, profits, costs, and resource management. Lean tools focus on the identification and removal of waste that lead to greater costs. Takt is the German word for “beat”. In Lean, beat is used to ensure that there is no difference between the manufacturing of a product and customer expectations. Takt time is the pace at which a product must reach its completion to satisfy customer demand. Takt time ensures that no time is wasted in the completion of a project and customer expectation is met within the time set for the meeting of the demand. 1. Sort – Classify materials that are essential, those that may come in use, and those that will not be used and must be eliminated. Sorting leads to better organization and management of space. 2. Set in Order – Everything must have a place from where it can be easily retrieved and put back. 3. Shine – Keep the workplace clean. 4. Standardize – Make the above three standards routine so that they become a habit. 5. Sustain – Keep up the results achieved through the above four standards. These five tools of 5S create a perfectly methodological and systematic work culture that prevents errors, confusion, chaos and wastage. You may think of a bottleneck as a flyover that is seeing too much traffic. When the traffic is light, the flyover is providing the best service, allowing the cars to move fast, but when there is heavy traffic, the cars are forced to slow down because the flyover has reached its capacity. In bottleneck analysis, performance bottleneck that exhaust the manufacturing process are analyzed to strengthen them. A process reaches a bottleneck when it is overburdened. Poka-yoke is a tool that is used to design products in such a way that there is a zero possibility of an error. Think of the Ethernet plug. Its design does not allow you to plug it in any other way than the correct way. Poke-yoke is a mistake proofing method. It is used in cars (the engine won’t start if all the doors are not locked), designing (computer cables that can only be plugged one way) and in virtually any area that can eliminate the possibility of an error through an alert system or designing. Jidoka allows partial automation of manufacturing processes. Full automation is expensive, and can overlook errors and defects. Therefore, partial automation is used to cut down on costs and ensure quality. The advantage of Jidoka is that errors are detected as they happen and eliminated without impacting the product quality. Moreover, quality can be improved when required, without adding much cost. 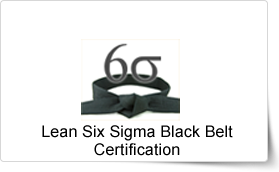 All public Lean Six Sigma Black Belt Certification Training courses include am/pm tea, lunch, printed courseware and a certificate of completion. Customized courses are available upon request, so please contact pdtraining on 855 334 6700 to learn more.